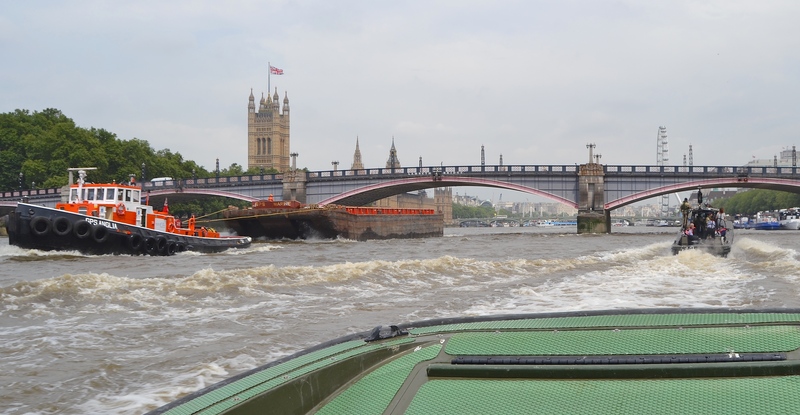 Approaching Lambeth Bridge, a reminder that the Thames is still a working river. Standing on the south bank opposite the Palace of Westminster, the National Health Service’s St Thomas’ Hospital and the surrounding area occupies land that, until the building of the Albert Embankment in 1866-1869, included many small industries, notably boat builders. ‘A View….. from Kings Arms Stairs, Narrow Wall, Lambeth Marsh’ (1791). This is about where the ‘London Eye’ is today. Westminster Bridge is in the background. 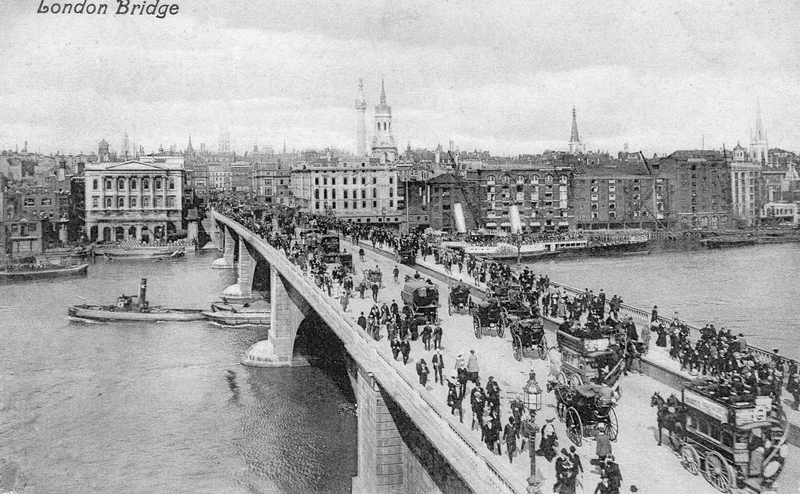 This splendid very high-resolution picture (click twice to enlarge) is from the website, “A London Inheritance”. A waterman in his Coat and Badge stands by the bow of the wherry in the foreground. ‘Lambeth and Southwark Waterfront, London’ (1853) by Richard John Pembery, 1820-1891. (Lambeth Archives). 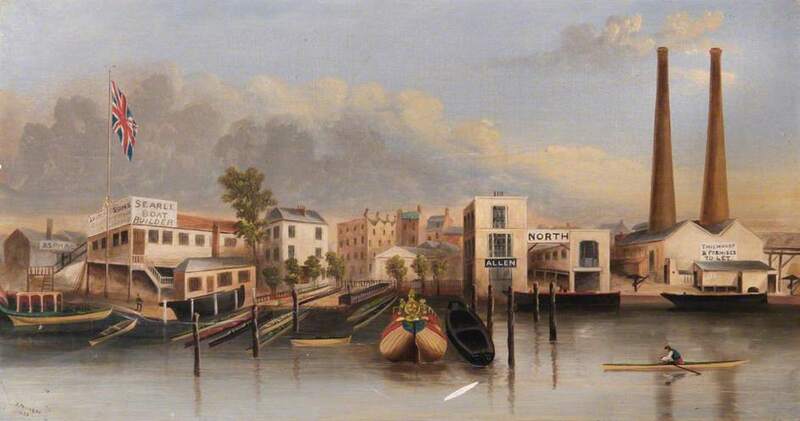 On the left, Searle’s boatyard was probably the most notable in Lambeth at this time and was the first home (c. 1818-1860) of what became Leander Club. A splendid article by Nigel à Brassard on both the origins of Leander and on the different versions of this painting is here. Other boat builders shown are Allen and also North. 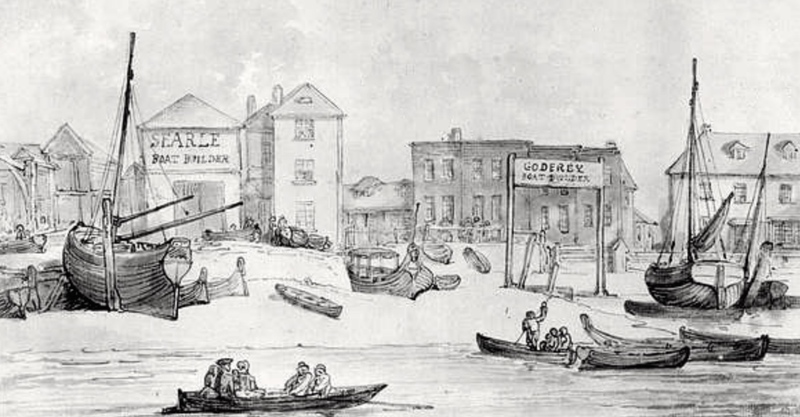 Searle’s and another boat builder, Godfrey’s, c.1840. At some stage, they were in partnership. 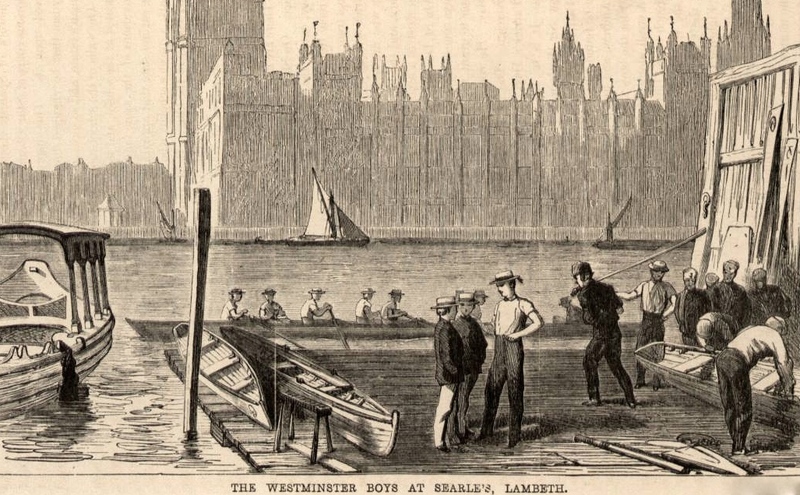 ‘The Westminster (School) Boys at Searle’s, Lambeth’. Date unknown but the current Palace of Westminster is shown opposite, so it is post-1852. 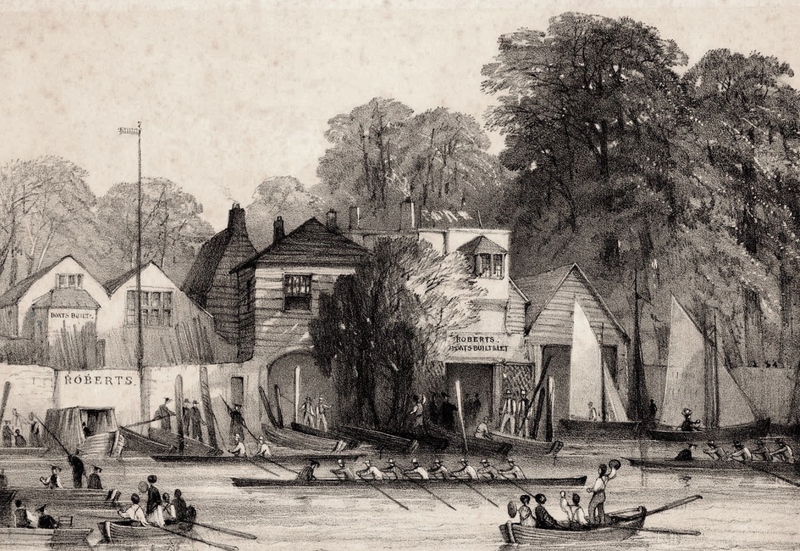 Upriver from Searle’s, near to Lambeth Palace, was Roberts Boat Builders, pictured here in 1860. Upriver again from Roberts, next to the old Lambeth Bridge. This 1866 view of Lower Fore Street shows, on the left, the Ship Tavern and Wentzell boat builders sharing the same premises and, on the right, boat builder Edward Wyld, from where Westminster School boated. 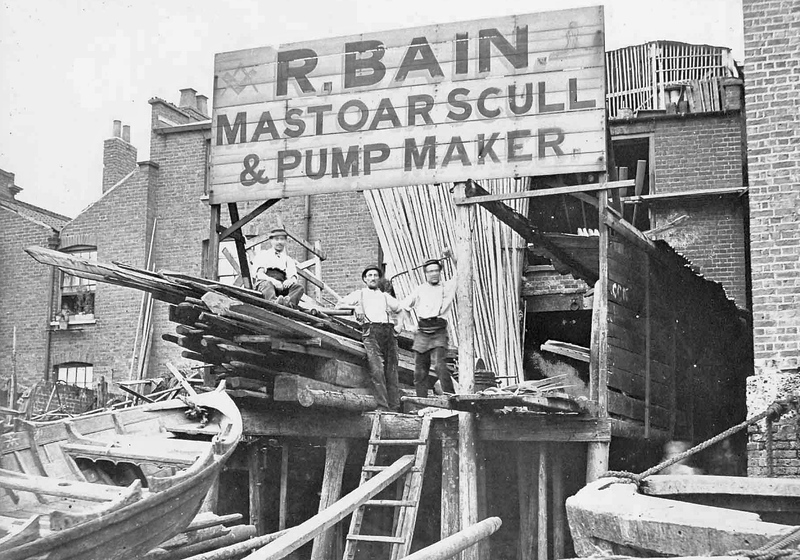 Robert Bain, mast, oar, scull and pump maker, was in Upper Fore Street, Lambeth. Presumably, in an attempt to attract Brotherly Business, he has faint Masonic symbols painted either side of his name. 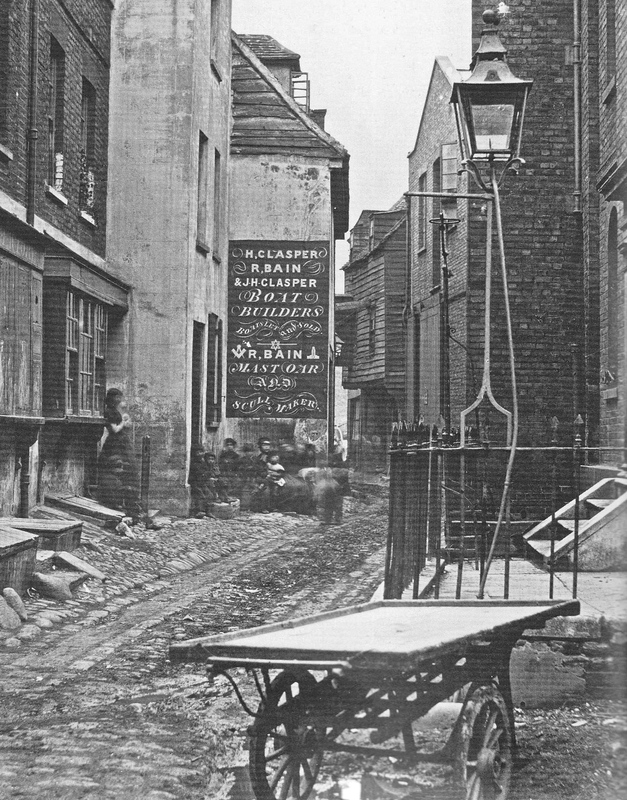 In another 1860s view of Upper Fore Street, the sign shows that ‘R Bain’ was also in the boat building business with two men having the magic name of ‘Clasper’. ‘H Clasper’ was presumably the legendary rower and boat builder, Harry (1812-1870), while ‘JH’ would be his son, John Hawks (1835-1908). The father did not ever live in London but perhaps added his prestigious name for business reasons. After moving South, ’JH’ worked, at various times, in Lambeth, Wandsworth, Oxford, Cambridge and Putney. There is a record of the Robert Bain and John Hawkes Clasper partnership in a business called ‘Clasper and Co’, boat builders of Lambeth and Westminster, being dissolved in January 1868. Around that time, another great name in rowing, that of Edward Ayling, oar and scull maker, was based next door but one. 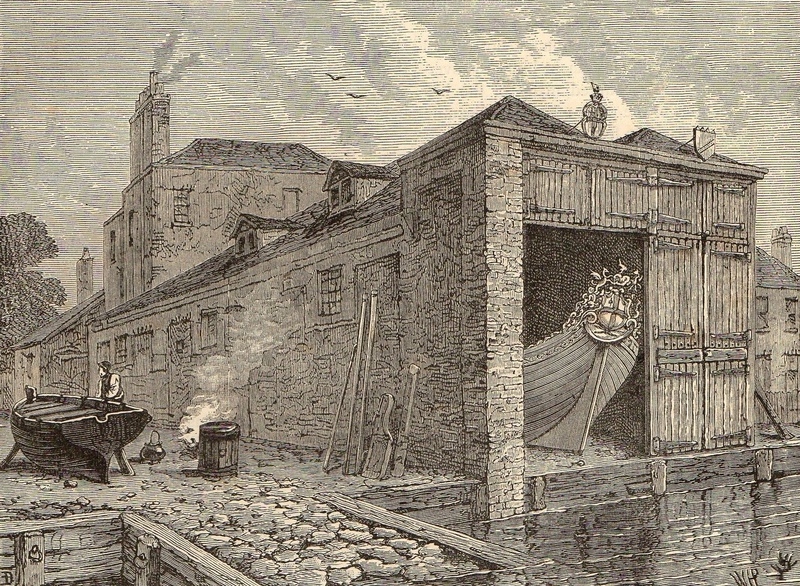 In the list of 50 barge and boat builders listed in the 1852 London Commercial Directory, ten were operating in Lambeth. 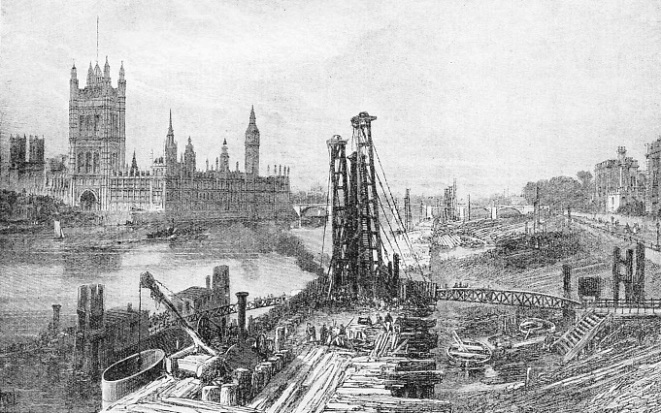 With the building of the Albert Embankment starting in 1866, three centuries of boat building was swept away in less than three years. Admittedly, much filth and deprivation was also removed – or was it just transferred elsewhere? 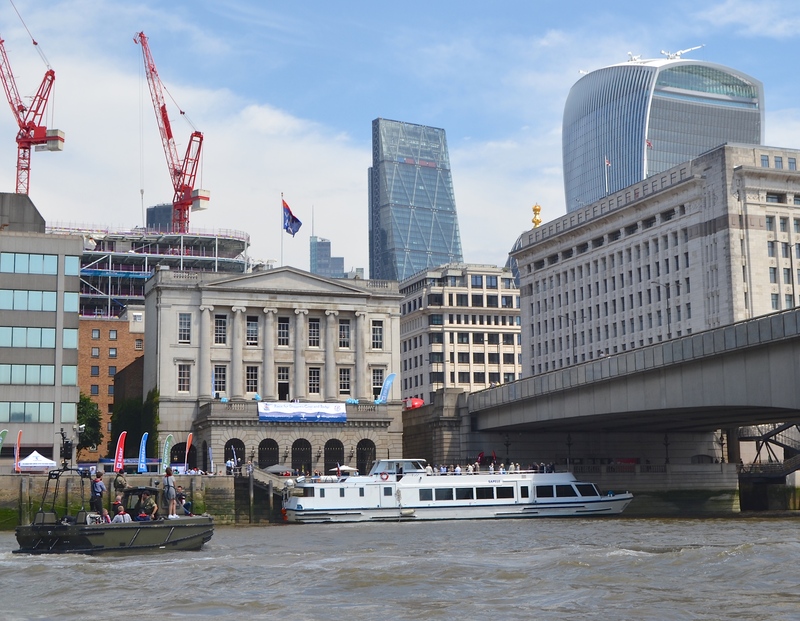 For historical reasons, the ancient trade guild, the Fishmongers’ Company, runs the Doggett’s and the race starts from outside the magnificent Fishmongers’ Hall. There has been four ‘Fish Halls’ around this site, the first in 1310, the next in 1434, another after the Great Fire in 1671 and this one in 1827. It is increasingly dwarfed by the construction around it, but my objection is not to the massive and spectacular buildings of recent years but to the surrounding modest and unimaginative products of the 1960s and 1970s. This postcard from the early part of the 20th century shows that the Hall was never surrounded by buildings of equal merit, even before the Blitz devastated the area. 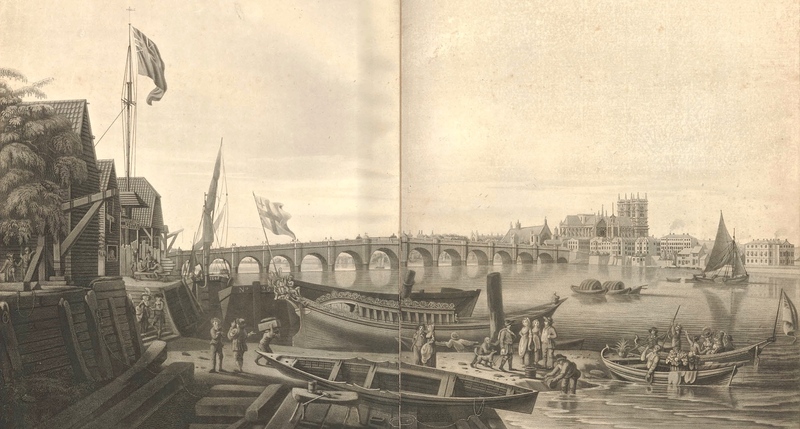 This was a busy part of the Pool of London and the river was lined with wharves and warehouses. 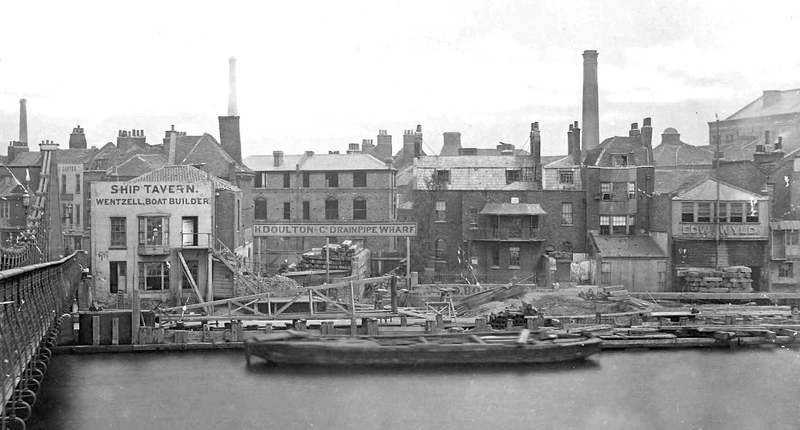 Even the Hall’s wharf was a working place, as can be seen clearly here. A picture taken last year of the Hall from the south bank. Much the same view as above, showing the start of the 1934 Doggett’s. 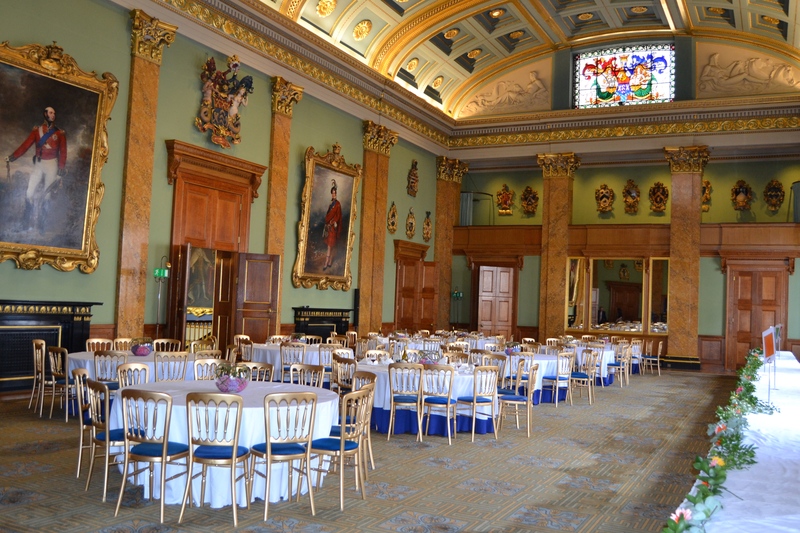 The wonderful Fishmongers’ Banqueting Hall. 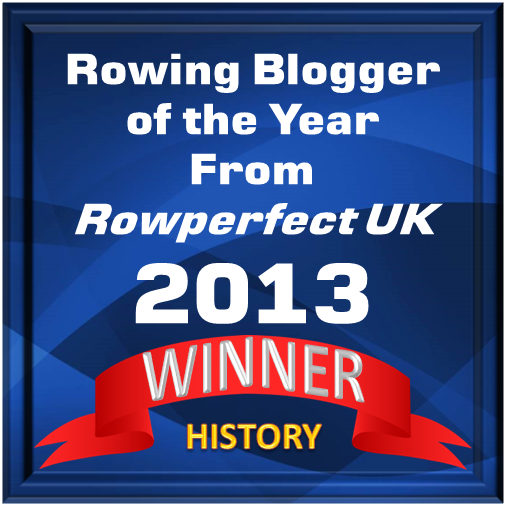 It is here every November that the winner of that year’s Doggett’s is presented at a grand dinner, the first time that he will wear his Coat and Badge. See the procession and presentation from 7 minutes and 30 seconds in this video. 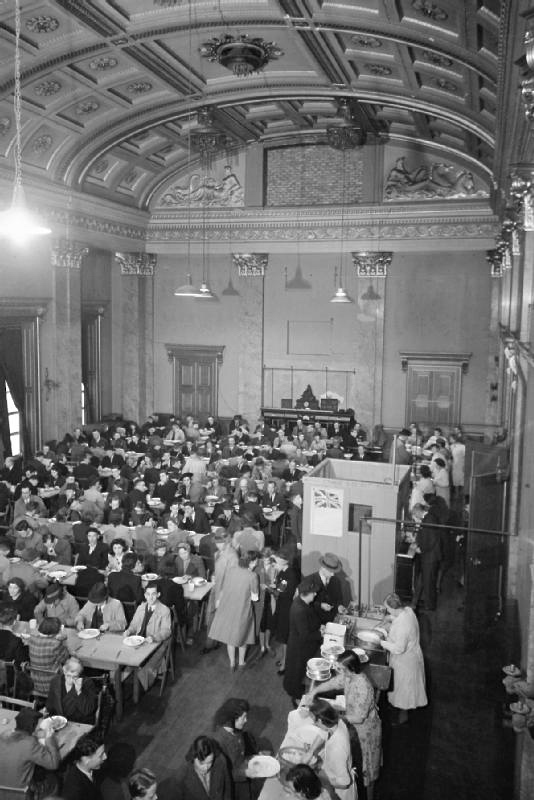 Sadly, the media were not invited to the post-race lunch this year but, in the 1939-1945 War, the Banqueting Hall was open to all as part of the Londoners’ Meal Service (LMS), a canteen providing cheap and nutritious meals for those directly or indirectly involved in war work. At their peak, the LMS Canteens were providing 80,000 meals a week. A two-course meal was a shilling (5p) and three courses were 1s 3d (8p). The photo above shows the similar but opposite end of the Hall to the picture above it, and it can be seen that the stained glass window near the ceiling is bricked up and all the paintings and treasures have been removed. On 9 September 1940, bombs fell on all sides of the Hall, causing great damage. Fortunately, most of the essential structure survived. The Hall also did its patriotic duty in the 1914-1918 War when it became a hospital for the wounded. Thus, my boat trip from Cadogan Pier covered over not only four-and-a-half miles of river but also hundreds of years of the story of rowing. 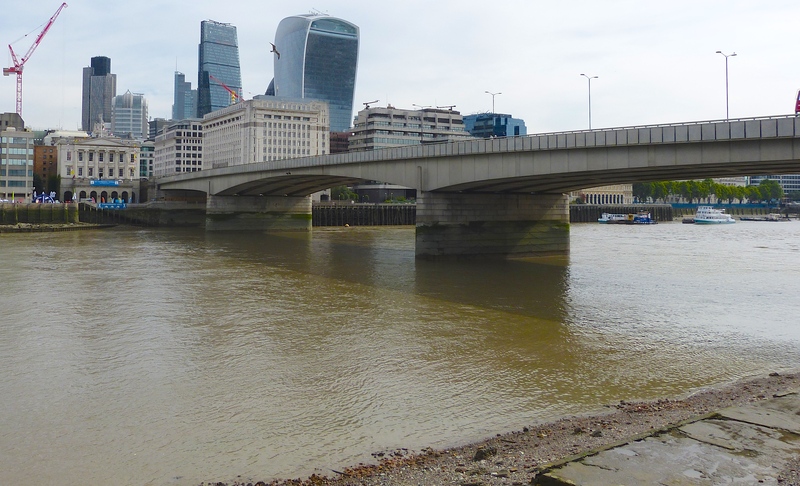 Proof, were it needed, that the River Thames is truly ‘liquid history’. Next Will the Real ‘Mighty Atom’ Please Stand Up? 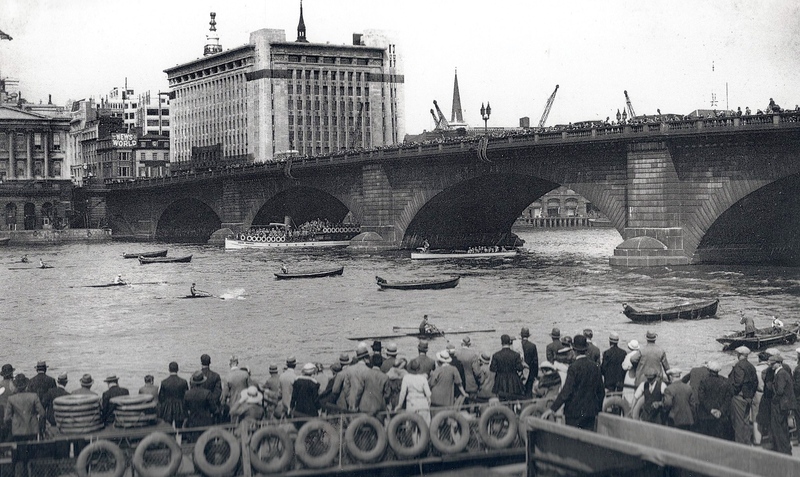 Tim, another v’ interesting article about the sport we love and the river it is rowed on but It has always intrigued me how the relatively prosaic occupation of fish mongering produced such a grand ‘hall’. Have you any ideas? Tim great article. I was going to use some of those in an article about the old Thames.